I am trying to experiment with posting more about some of my administrator work, even though it might be boring. This will provide some detail about one of the biggest things we had to do this past year to keep the school running. I started this post back in February, but am just now finishing it. If you make it to the end of this, let me know what you think about this kind of post. The working lunch is the most tense. During that time the evaluator will process all the evidence they’ve gathered and give you a preliminary rating on the spot. For all the stress it causes, it is actually a really good opportunity for our school. While most ratings seem to only look at the quantitative measures of a school, the QR takes a qualitative approach. This can be very good for a school like ours who works with a population that can succeed with things the quanitatiave measures won’t pick up. If the Microsoft word flow chart didn’t tip you off, the most important areas are Curriculum, Pedagogy, and Assessment, often called the instructional core. When your review is finished your final score will be five ratings. 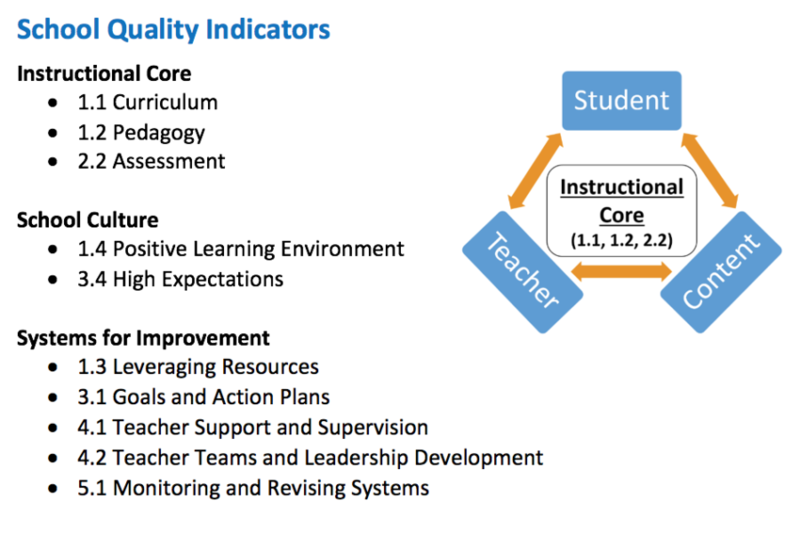 I rating for each area in the instructional core, one rating for school culture and one for systems for improvement. The observers will look at the evidence they collect from around the school in order to figure out where the school falls on this rubric with the highest performers getting a “Well Developed” rating. In the past we would only have one day for a visit, but this year we had two action packed days. We knew that we are having an QR from the beginning of the year, so we could get a number of things going from the beginning of the year. The number one thing was the Principal working out the School Self Evalution Form way ahead of time. About a month ago the QR date was announced, he was able to share a finished draft of this document that we as an admin team could give feedback on. Later, the school school read and provided feedback on the SSEF as we used it to think of the kind of evidence we wanted to highlight. The document was a really clear picture of what makes our school special. Having the clear vision of what we are about drove our upcoming cabinet meetings, staff meetings, and department meetings. We all thought about what we need to observer to see in order to really witness the vision of our school. lessons would be best to highlight. The administrators then worked to take all of the different resources, student work, and lessons plans that people were proud of and gathered it in to binders or google drive folders. These would later come in handy when the evaluator wanted to see evidence of one thing or another. We also used all of the notes we had collected at those meetings to remind our staff on the day of the review in case they got nervous and forget what they wanted to say about the school. As we prepared for this we had to spend a lot of time helping people stop freaking out. A great thing about our school is that people pull together when things like this happen, but people might get too worried. It is important to focus people’s efforts on what is important. When talking to teachers that’s letting them know it’s probably more important that they revise their lesson plan, and get a good night’s sleep than to get all brand-new bulletin boards up. When talking to kids it’s letting them know that someone new is in the school. If they are selected for the student panel reassure them that they aren’t in trouble, and in fact they have an important opportunity to explain parts of the school like clubs, or guidance work, that aren’t going to come up in other meetings. During the SQR I spent most of my day running around the school, as the Principal has one on conversations with the reviewer for most of the visits. Most of my time was either spent calming people down, or dealing with the “OF COURSE THIS IS HAPPENING TODAY” things that you know are going to come up. We got to school early to have the initial Leadership meeting with the evaluator. I would sit on three of these meetings and I would look for opportunities to make my Principal look good. It felt like I was sitting in on three conversations between the evaluator and my principal. The first leadership meeting was us saying: “This is what you’re going to see, and here’s some documentation about that” and the Observer saying “I’ve already learned so much from your SSEF. Can you tell me more about this one specific thing?” The observer was as nice and polite as you can be while still maintaining a poker face. (What I’ve learned about the observers I’ve met is that they are nice people, who want to help schools get better. They have a hard job and being impartial is a must, so they may come across cold even when they may actually think your school is great). After the first round of classroom visits there was a second meeting. Classroom visits were only the principal and the observer, so their conversation was hard to follow without context. The observer highlighted the things they had seen and the things they hadn’t seen in the classes and in the meetings they were in. We could also ask about questions about this, occasionally referring to items in the binder that showed evidence of practices the observer might not have seen. things that she might not have noticed or might not have had. I remember at some point running to my office and printing out a whole set of team meeting minutes to explain the pedagogical alignment of a lesson they watched for 10 minutes.